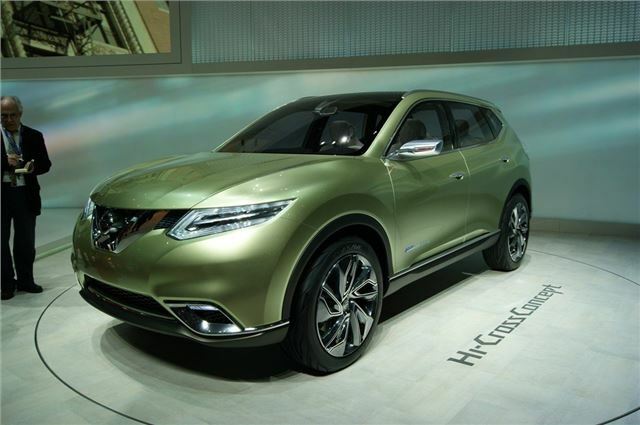 Nissan has shown its Hi-Cross concept at Geneva Motor Show. It’s a hybrid powered crossover 4x4 with space for seven passengers, despite fairly compact exterior dimensions. While it's only a concept it does show the way for a potential new Nissan design ‘language’ that is likely to appear on many future models. The hybrid powertrain combines a 2.0-litre petrol engine with an electric motor. A modified CVT automatic gearbox improves fuel economy by 10 per cent over a traditional CVT, and transfers drive to all four wheels.In town driving the car can frequently disengage the engine and run on electric power alone, improving economy – and as you’d expect it cuts out when the car is stationary. As the Hi-Cross is a concept it won’t make production, but details of the styling might make it into production on Nissan models in years to come, like the next generation of Murano, Juke or Qashqai.